Coarsely grind the pork, round steak, bacon, salt, and garlic together a meat grinder or food processor. If you use a food processor, take care not to grind the meat too finely; you want the meat to have some texture. Place the ground meats in a large ceramic bowl, add the remaining ingredients, mix thoroughly, cover, and refrigerate for 24 hours. 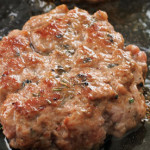 Form the meat into patties and fry them in a skillet over a medium heat for 3 to 4 minutes per side, or until no pink remains on the inside. Drain the patties on paper towels and serve hot.